*Because of the large number of teams, the league has been divided into two divisions. Pebble Beach Division (4/9): Spring Break, no matches this week. Cypress Point Division (4/10): Spring Break, no matches this week. Cypress Point Division (5/22): Match play schedule is complete. match, please let us know well ahead of time. non-scoring matches, please contact one of the other teams. Miller Creek and Kent advance to the final on Wednesday May 30th where they will play Sinaloa and St Hilary. Any player not on those teams and that has met the criteria for playing in the individual tournament can still sign up by calling Bruce at 415-492-1800X 1. 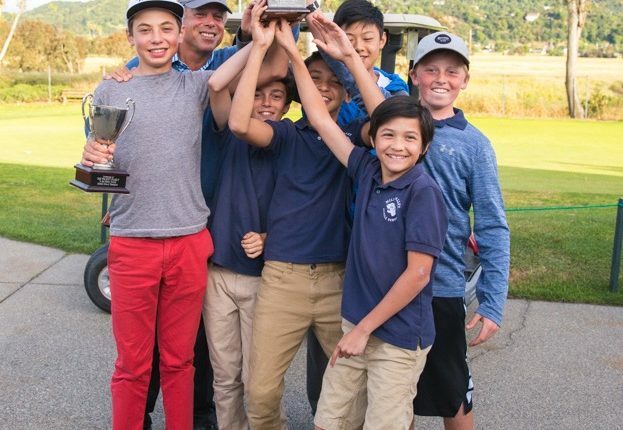 Winners of the 2018 Marin County Middle School League! Congratulations also to Niall Donegan winner of the Alex Wilmott trophy with the best individual score of 31.